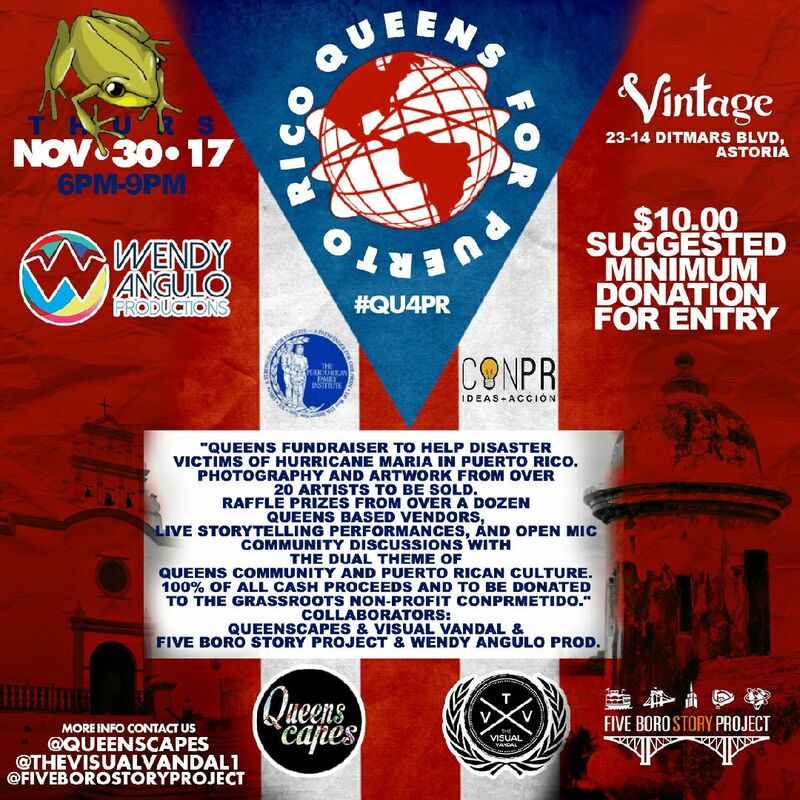 A celebration of Puerto Rican culture and Queens community, the Queens for Puerto Rico (#QU4PR) fundraiser event will feature a pop-up exhibit with photographs and artwork from Queens-based artists, live storytelling and spoken word performances, plus raffle giveaways donated by Queens-owned businesses. Early attendees will enjoy complimentary wine from Vintage and pizza generously provided by Sac’s Place Restaurant. * And poetry by actress and poet Jessie Cotto. $10 suggested minimum donation. 100% of proceeds will go to ConPRmetidos, a San Juan-based independent, non-partisan and non-profit charity, on behalf of the Queens for Puerto Rico relief fund. This fundraiser is organized by Queenscapes in collaboration with Five Boro Story Project, Wendy Angulo Productions, and The Visual Vandal. DIRECTIONS: Vintage wine bar in Astoria is located at 23-14 Ditmars Blvd, between 24th and 23rd Street. The closest train is the N/W to Ditmars Blvd.